The Museum of Ontario Archaeology’s logo reflects our belief that archaeology is (first and foremost) about people. The hand print represents the people whose stories are being brought to life through archaeological research as well as everyone involved in archaeological activities. The stylized palisade represents our connection to the Lawson Village, a 16th century Neutral Iroquoian village located beside the museum. Together the palisade and the hand print represent the people who lived in this place, MOA’s responsibility to steward and protect the site, and the people who continue to draw meaning and value from their ongoing connection to the history of this place. The logo is designed to work effectively in both colour and in black & white. The colours represent energy, excitement, and adventure. 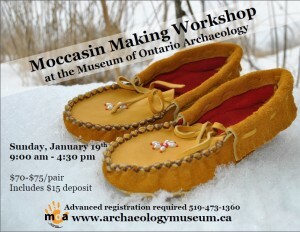 Back by popular demand, the Museum of Ontario Archaeology is hosting another Moccasin Making Workshop. 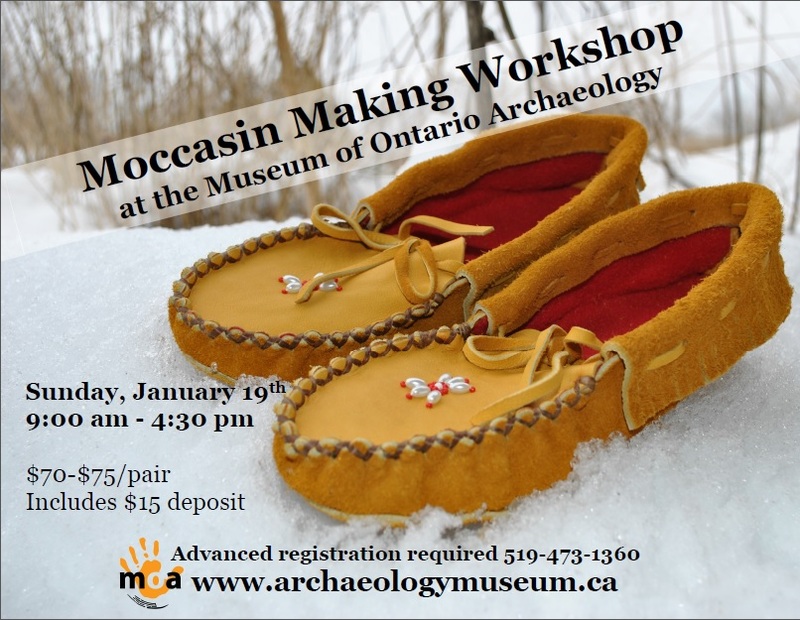 Register now for this unique opportunity to make your own pair of moccasins! 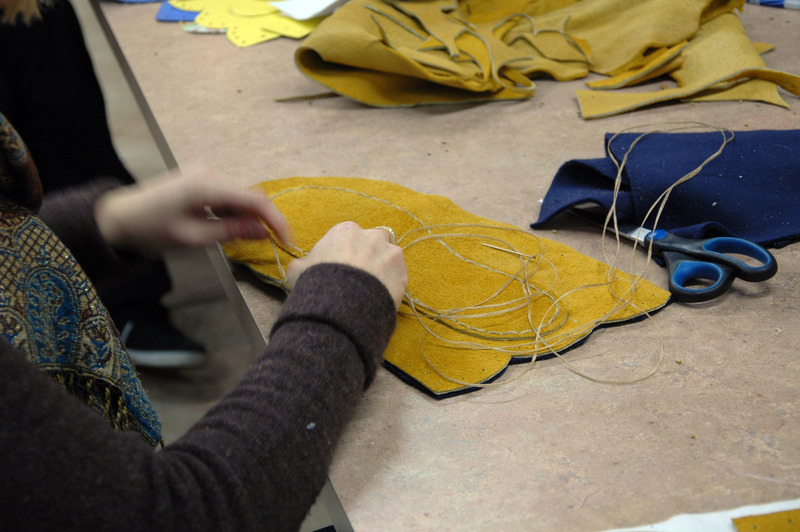 Six Nations artist Marjorie Henhawk will be teaching you how to make your own pair from genuine hide and cozy felt. Create a pair to fit your own feet or as a gift for family/friends. 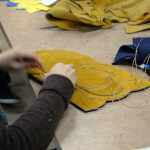 Location: The workshop will be held in the classroom at the Museum of Ontario Archaeology. What to bring: Please bring your own bagged lunch and morning coffee (if required), an outline of each foot, and a sharp pair of scissors. Update: Please also bring a fleece lining if possible but not a very thick (you’ll have to sew through leather and the fleece! Advanced registration is required – space is limited to 10 registrants. Register by phoning the Museum at 519-473-1360. Please note: Registration is now full for this workshop but please contact the museum to be placed on a contact list for future workshops. The week of December 2nd, MOA welcomed Lindsay, a high school student from Alymer who spent a week taking part in a job shadowing experience. Lindsay enjoyed her time at MOA where she worked with our collections and helped with educational programming. Lindsay learned how to use PastPerfect software which is used to catalogue the collection. She handled artifacts and learned how they were stored for archival purposes. She even had a unique chance to tour Sustainable Archaeology. 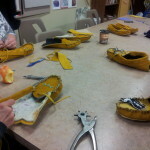 At the end of the week, she was more involved with educational programming, helping with pottery and soapstone pendant workshops and even sat in on some tours. Have a listen to an interview between Jennifer (MOA’s Public Relation officer) and Lindsay about her time at MOA. The Museum of Ontario Archaeology is open Wednesday – Sunday from 10 am – 4:30 pm. This month’s newsletter features a Year in Review. Learn what changes MOA has undergone this year from new kiosks in our permanent gallery to updated school programming. 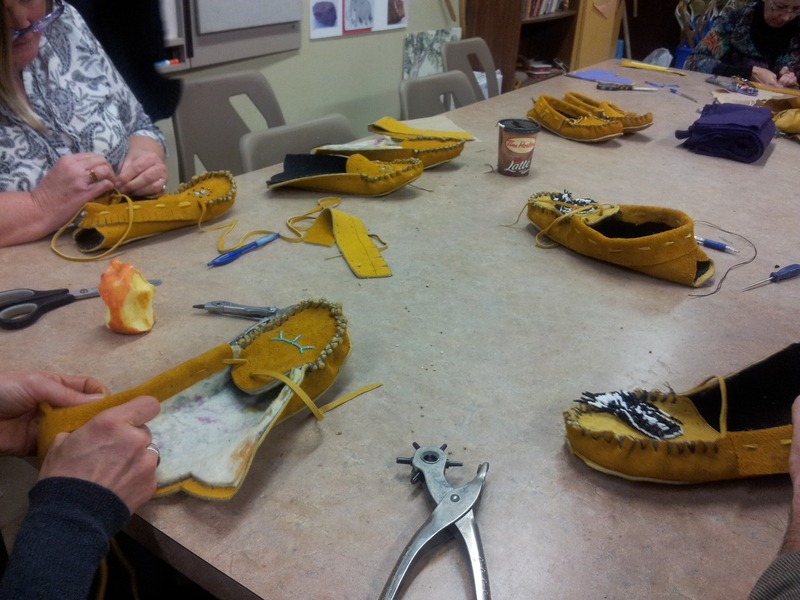 We are planning another moccasin making workshop in January. Sweat Lodge dates and our Holiday hours are also listed.